How to draw in black and white using pen, pencil or markers. Ballpoint pens are readily accessible and easy-to-use drawing tools for black and white pictures. They also present their own challenges and limitless possibilities, which we'll explore in these drawing tips. 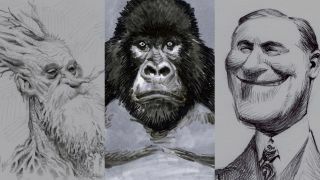 You might prefer to draw your black and white artworks in pencil or with marker pens, which we'll explore too. And if you need to stock up your pencil case, don't miss our roundups of the best pencils and best pens. When drawing with markers, try to get a variety of black tones to work with in order to create a maximum range of values. Markers draw really quick and clean but can be a little difficult to work with if you're not used to the starkness and graphic nature of marker work. Because markers use so much ink, they tend to run out quickly. However, just because a marker is fading doesn't mean it's not useful anymore. Markers that are running out of ink are great for creating texture or blending together tones. I find them just as necessary in the drawing process as fresh new markers. We can do a lot with one pencil but we can broaden our range of values if we use a variety of pencils. I prefer to use two or three different pencils, starting with a 2H. Pencils with the letter H have harder lead, which won’t mark my paper as much so their lines will have a lighter tone. B pencils make blacker marks than H, so I use these more towards the finish. Just like when drawing with ballpoint pen, a blank sheet of scrap paper can come in handy when drawing with pencils too. Pencil drawings – particularly those done with B pencils – can smudge very, easily so I like to put a blank sheet of paper under the heel of my hand as I draw so as to protect my work in progress.